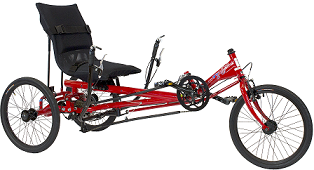 Our popular recumbent model with underseat steering system. Height: up to 74 in. 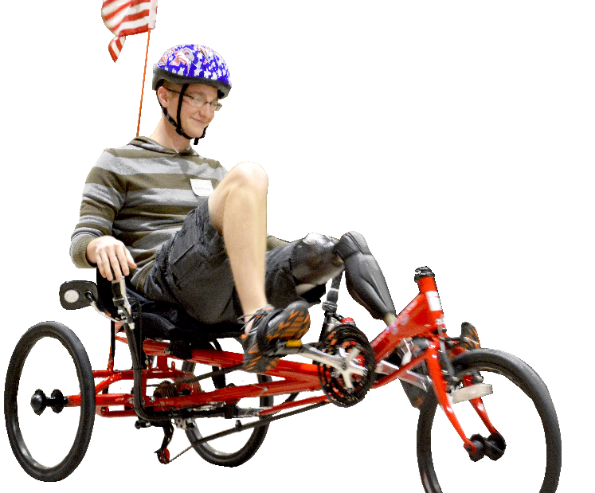 The JT-2300 USS is a full-featured recumbent recreation tryke designed for riding on paved trails and roads. 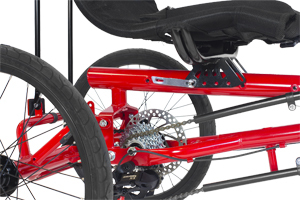 The JT-2300 USS boasts a fully adjustable recumbent seat that will comfortably accommodate most adult riders. 14-speeds allow riders flexible gearing to navigate variable terrain with family and friends. Freewheel hub allows coasting. Because of this, riders must be advanced or closely supervised. The tryke’s turning radius is 10 feet. Available in Amtryke red. Expert assembly required. 9/16" Exercise Pedals; 9/16" Expanding Pedals; 9/16" XL Exercise Pedals; Toe Clips; Rearview Mirror; License Plate; Safety Flag; Water Bottle Be the first to leave a comment for this product.